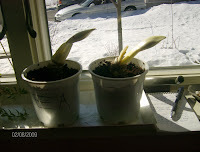 Hypothesis: The Amaryllis that receives worm tea weekly will do better than the one receiving just water. 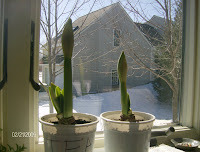 Results: The Amaryllis receiving worm tea grew faster, bloomed faster and the bloom lasted longer than the one receiving just tap water. 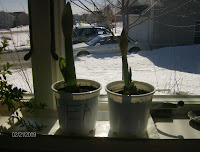 Yes, our plant with the worm tea had 2 blooms, but I think that was just chance. The photos tell it all. 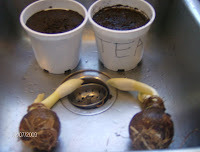 Try making some worm tea for your indoor plants. It never fails. With the retreating snow, frozen dog poo is revealed in my yard near the sidewalk. You'll find this also at the beach. I understand this is not always controllable and forgive the owners who forgot to bring a bag. I don't have a dog, but I sympathize with owners who have to clear the yard in the spring. The typical dog produces more than 200 pounds of waste each year, according to the USDA's Natural Resources Conservation Service. There is a solution, and I don't mean entombing the poo in a plastic shopping bag. Of course, the solution involves worms! When it comes time to pick up after your pet, plastic shopping bags are bad options. If you choose plastic, you are wrapping something that degrades quickly in something that takes decades to break down. Instead, use sturdy paper, or plant-based biodegradable bags. The corn-based BioBags, for example, are certified by the Biodegradable Products Institute to break down in a matter of days (in industrial landfills; probably longer in a home compost pile). If you chose to compost your pet waste,you should have a separate compost pile for pet waste, and you should not use the resulting soil on anything edible. As always, you want the compost pile to be HOT. The best practice is to ensure optimum temperatures is through layering and turning. The best solution (in my opinion) is to collect the poo in a bag (paper or biodegradable) or with a shovel and use it to fertilize your lawn (ensuring it is never used for food). Essentially you are vermicomposting dog poo outside in the ground outside with a fancy cover. My website shows how you can make your own a poo-doo vermicomposter to put on your lawn (http://www.wormmainea.com/Projects.html). You dig a hole in your lawn and insert a roll-top garbage can with the bottom cut out. Fill the hole half way with bedrun worms and it is ready to go. Be sure to place it away from low-lying areas of the lawn. When it is nearly full, dig another hole, remove the garbage can and start again. You can cover the old hole with the sod you dug for the new hole or new grass seed. Like the grass near the septic tank, it will be a lush spot in your lawn. The response on this has been great from people using it. It makes so much more sense than sending it to the landfill. If you have worms, you can do this in about an hour with a cash outlay of <$20 to buy a container with a cover (like the Rubbermaid bullet 2 gallon roll top can) that will last for years. Try this in your yard and let me know how it goes.